From my office window in the Denver Tech Center, I see two striking things that relate to the area’s rapid growth. The first is a new 300,000-square-foot office building that reflects Denver’s diverse opportunities for private commercial real estate investors. Then, there are the spectacular Rocky Mountains, just 15 minutes away. Another hour or two and you’re skiing or hiking in Breckenridge or Vail. If you have an active lifestyle, Denver is the place to be. For the companies that are tenants in those office buildings, the locale is not only a job-recruiting bonus, it’s the resource that makes this area one of the world’s top live, work, and play environments. U.S. Census Bureau stats show that Denver experienced extraordinarily high population growth in the seven years ending July 1, 2017, swelling to almost 705,000 people up from 600,000 in 2010. Companies are flocking to Denver and developers are responding to the increased demand for commercial real estate. In Denver’s downtown area alone, more than $1.35 billion in new development was completed in 2017 and early 2018, and another $2.26 billion is under construction or planned. But growth is also spreading outward, and municipalities are spending the money and time to build infrastructure to support this development. Denver’s population growth is a healthy 1.77 percent, which tops that of other fast-growing cities such as Atlanta, Seattle and Phoenix. With a 2.6 percent unemployment rate, companies in Denver continue to attract new talent. Over the past 12 months, Denver has created jobs in nearly every employment category. I meet people nearly every other week that move here for the lifestyle and find jobs almost immediately. Not surprisingly, Denver has also attracted tech companies and startups that rely on millennial talent. Colorado has the highest rate of young entrepreneurs in the country, according to a report from the Kauffman Foundation. Established companies in downtown Denver include Facebook, which is stepping up data-center hiring. Western Union is moving to a building in the outlying Denver Tech Center that sold for $152 million. And VF Corporation, the parent company of outdoor lifestyle brands that include North Face, JanSport and SmartWool, just announced that it’s moving its headquarters to Denver, bringing 800 more high-paying jobs to the area. In nearby Boulder, Google’s scenic campus includes dog-friendly features and an indoor fire pit. Google has plans for a third building, which could bring its headcount to 1,500 people. Private real estate plays a major role in housing Denver’s new workers. In response to high population growth, there are 30,000 new multifamily units under construction or planned for metro Denver. However, due to current labor shortages and typical construction delays, the industry has been unable to deliver more than 10,000 units a year. 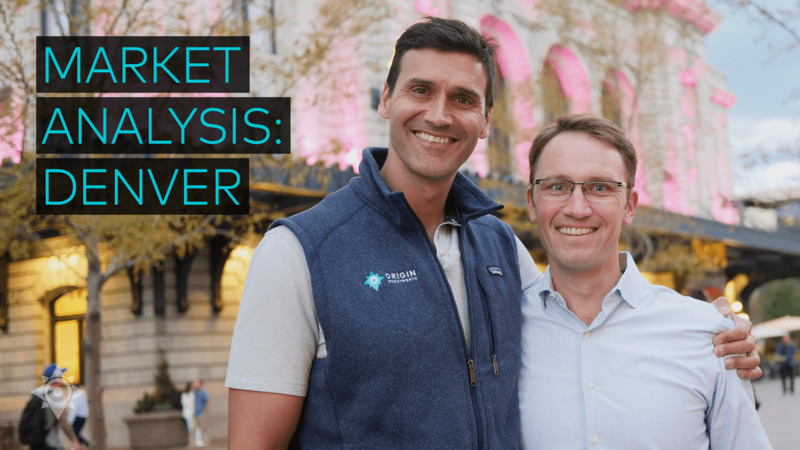 Dave Scherer and Thomas Briney tour Denver in a market analysis update. Even as the development pipeline fills and stalls, the yearly absorption has hit a new record of more than 10,000 units a year—the highest rate since records have been kept starting in the early 1980’s, notes JLL. Rents have risen 3.8 percent over a year, yet remain more affordable than other major markets, or the U.S. as a whole. Denver moved up to seventh from eighth in CBRE’s 2018 report on top-ranked cities for property investment, and multifamily and office real estate activity has attracted keen investor interest. But it’s a tricky and tight market. While competition for homes in the area have been fierce for years, the latest battleground is proving to be the commercial real estate market, noted The Denver Post this past spring. While buyers are eager to acquire properties with development or redevelopment potential at the right price, sellers are taking advantage of the lending environment and choosing to refinance while waiting for top dollar. Private real estate investors need persistence and creativity to compete in this environment. Because Origin has boots on the ground in Denver, we can move quickly to review and approve deals. This year, a relationship with a willing seller lead us to the acquisition of the 320-unit The Fletcher Southlands apartments (formerly the Advenir at Saddle Rock) near The Southlands Lifestyle Center in Aurora. We seamlessly executed a complex debt assumption process to acquire the multifamily property off-market. Such an arrangement requires knowledge to execute the deal and the operational track record to secure lender Freddie Mac’s approval. A value-add strategy helps private real estate investors deliver updated facilities that are in short supply. We recently remodeled common spaces at the Office @ DTC in Denver Tech Center. A new lounge, conference rooms and a fitness center made this office space more attractive for current and prospective tenants. Bottom line, I believe Denver is a great real estate investment. Infrastructure improvements such as new commuter rail systems, the airport expansion, extensive roadwork and an expansion project to enlarge the Metro Denver’s water supply show that local governments are taking steps to sustain the region’s growth, and giving private real estate investors a clear reason to invest for future prosperity. Tom joined Origin Investments in early 2011 and is responsible for sourcing and structuring investments in multiple markets across the Western US. Before his current role, he served as Vice President of Asset Management for Origin Investments, overseeing the firm’s portfolio assets. Tom has worked with the Origin team for over eight years and has thirteen years’ experience in the commercial real estate sector.